It's time for me to face the facts: I don't know how to dress in the summer time! I am a layering queen at heart, and when it is too hot to do so, I am at a loss. I simply could not resist to pull out this flannel to layer over my sheer tank. It will be perfect for the evening, I just know it. i'm in love with your shorts, high-waisted shorts are basically my favorite summery item. Ooh I love the shirt! Also loving that studded bracelelt too! I'm also at a loss when it comes to summer wardrobes! I wanted to layer up so badly today but when I walked out, the 90 degree heat punched me in the face. I just went with it, though, and drove to an air-conditioned store. 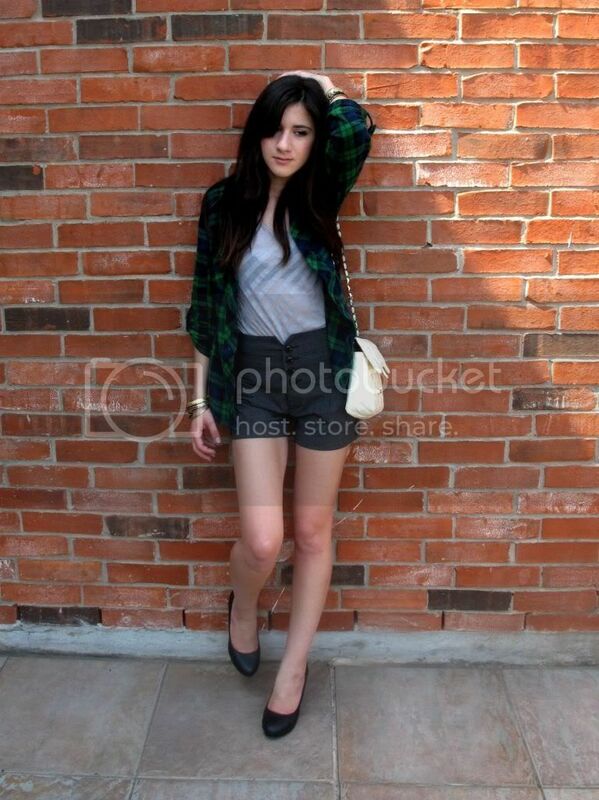 I love this outfit of yours - the flannel top is the perfect addition! j'adore la chemise ! Love the shirt !! i'm the same, i hate dressing for summer, i'm not a summer dress girl, i need more! haha / i totally get that . i hate the summer . i was just telling my friend that was looking to reinvent my summer style . hot look. i adore your wristwear, and that green plaid! Love the shorts. I agree with you--one layers feel so...unfinished sometimes. great shorts. I totally know what you are talking about, in the summer i can't seem to wear anything besides shorts and a tank top. I guess that's when you bring out the crazy accessories and silk scarves? I'm a sucker for plaid and that is indeed one of the world's most perfect plaids. I like the shorts and bracelets, too. i want the same shorts! so stylish! nice shirt. especially with the shorts. What a lovely short. U are so pretty! But you look awsome! Great job! you look great!! but i'm not sure how long you're going to be able to get away with flannel... haha. good news, though: i just checked the weather for today, and the high is only 80! p.s. I CAN'T WAIT TO SEE YOU IN LIKE TWO HOURS!!!! i had the same revelation the other day--what am i going to do in the summer time when i so desperately want to layer yet it's too hot to deal with clothes? part of me thinks that running around in strappy dresses might be the key...with a sweater stashed away in my bag! I love the flannel colors. Those shorts are awesome! I also have a hard time dressing for summer, due to layering tendencies. I'm hoping I can find some sundresses that I feel comfortable wearing without extra layers! the shorts are the best. oh my i also want a chanel ripoff (well maybe yours is even real) the white is perfect for summer. who says you cant dress for summer! I l-l-l-l-l-l-l-l-ove those SHORTS! an i ask where you got them? They are the deffinition of love! So cute! i just love your style, you are such an inspiration. Doode, I loove the plaid and the shorts! I don't know how to dress in the summer either. I love your shorts the buttons on them are adorable. The shorts are what I love the most. love the plaid.. and the bangles are awesome! i can't dress for summer either yet i find myself wishing for the season when i'm freezing in the cold!! That flannel shirt is so lovely! And wow, the shorts look great, love the buttons :) I'm struggling with the adjustment to warmer weather too, I went out with three layers on today and only realised something was wrong once I reached the end of the road lol. you and i are in the same boot, every summer i feel like i need to relearn how an outfit can be made without the need of multiple layers...its just so tempting! 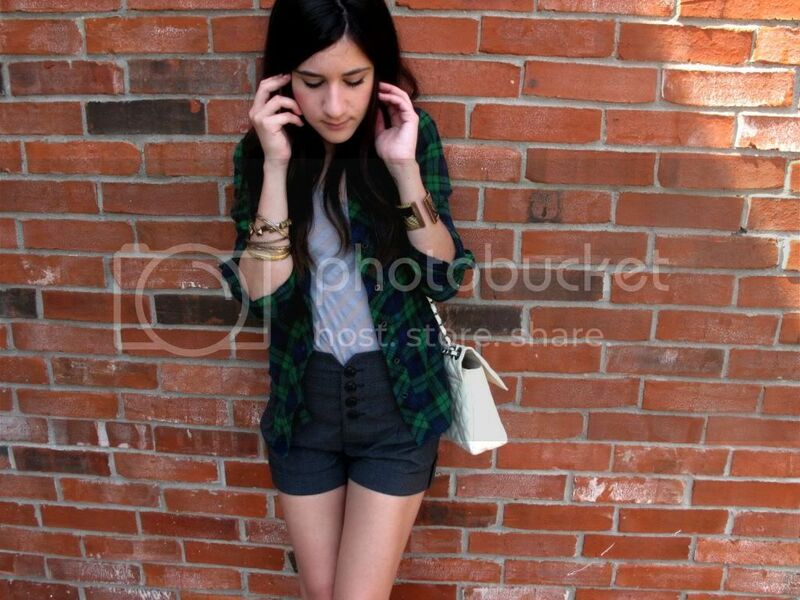 love the contrast between the tailored shorts and slouchy flannel shirt. LOVE your shirt !! You look amazing ! I love your blog ! Sigh how I wish I could layer my outfits too... but it's summer all year long where I live. I love how you added that flannel shirt for color and the bangles are a great contrast too. You look gorgeous. Those shorts are perfection.